Getting The Bedfellows Of Immigration Policy Right : NPR Public Editor The Center for Immigration Studies is happy to court controversy in the current debate over immigration. The influential Washington think tank favors greater immigration restrictions. But when a Morning Edition story called the group "decidedly right-wing," it rightfully objected. 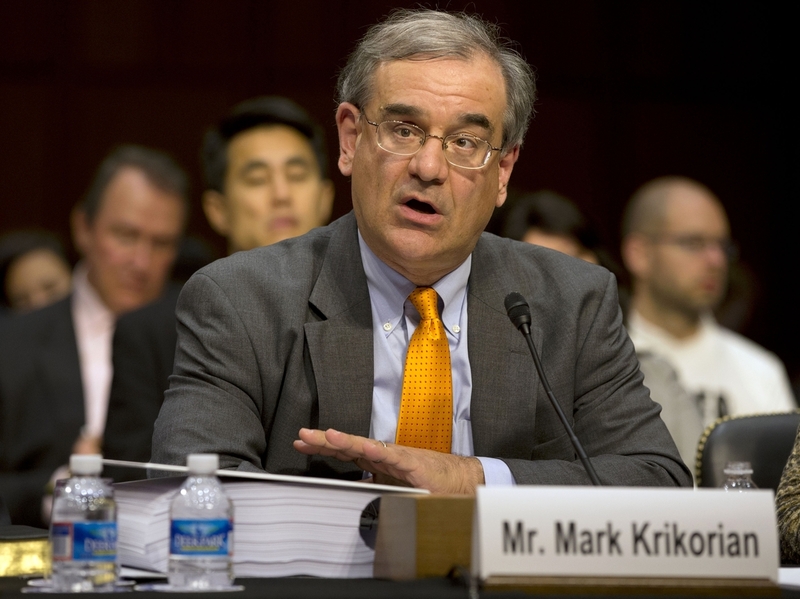 Mark Krikorian, executive director of the Center for Immigration Studies, testifies on Capitol Hill on Monday, April 22, 2013. When interviewed by Michel Martin on Tell Me More in June, Kirkorian was identified as having a "more restrictionist approach" to immigration. The current opposition by House Republicans to the bipartisan immigration bill that passed the Senate might give the image of immigration as a left-right issue. It is not. As University of Oregon professor Daniel Tichenor put it in his acclaimed book, Dividing Line: The Politics of Immigration Control, immigration has been one of those vexing matters since the founding of the Republic that brings together "strange bedfellows." On one side, the humanitarian left is united with the libertarian right and business groups in favoring the admission of more immigrants than come in legally today. On the other, many left-leaning labor unions and the populist right favor restricting the flow to levels lower than today's. As a former reporter of moderately liberal persuasion who reported on immigration issues for many years, I would not have come to work at CIS if it could credibly be described as "decidedly right-wing." In my view, as in the view of many Americans, "decidedly right wing" functions as an epithet. It is freighted with connotations of rigidity and ideological fervor. In the context of immigration policy, it is suggestive of racism and intolerance. Martin Kaste is a fine reporter. His work is generally insightful and fair minded. His May 9 story made an important point about an unusual and powerful alliance that is attempting to influence immigration reform legislation. But his mischaracterization of CIS as "decidedly right-wing" was based on reporting that can most charitably be described as sloppy. "Sloppy" to me is too harsh a word for a common mistake, but I can understand Kammer's ire. Not only was Kaste wrong, but also he refused to write a correction to the Web version that is still up. I say this as someone who has known Washington-based CIS for years. Before taking on this ombudsman role, I taught a course on immigration policy at Harvard Kennedy School and wrote an op-ed column for The Washington Post that focused extensively on the immigration debate. I usually — and publicly — disagreed with CIS on many occasions. But it is not "decidedly right-wing." Host Michel Martin of Tell Me More interviewed CIS executive director Mark Krikorian on her show in June and more correctly labeled his affiliation. In introducing him she said, "He's the executive director of the Center for Immigration Studies, which tends to favor a more restrictionist approach." Kaste's editor, Quinn O'Toole, managing editor of NPR West, seems now to agree that a mistake was made. "We could have done better," O'Toole wrote to me. "Brevity is a must in our medium, but this is a case where more words would have been better. We should have given a fuller description of the organization in question." I hope that this means a correction will be written on what otherwise was a fine story. Indeed, it dealt with political alliances, in this case those surrounding the immigration of high-skilled workers. Partly behind the mislabeling of CIS is that it was founded in 1985 with the help of John Tanton, an environmental activist who also was involved in the once faddish movement for zero population growth. Readers who wish to delve into old charges and counter-charges of racism might read these links from CIS and the Southern Poverty Law Center. You can decide for yourself on the history and Tanton. Both, however, are irrelevant to the right-left labeling of CIS today. Mark Krikorian clearly is conservative. But, of course, that is not the adjective Mr. Kaste used. He called CIS "decidedly right-wing." Meanwhile, he used benign terminology to describe other groups. He identified the Economic Policy Institute--which is frequently labeled "left-wing" by groups that want to discredit it--as "left-leaning." He identified other groups, including Progressives United, simply as "liberal." Moreover, rudimentary reporting would have informed Mr. Kaste that while Mark Krikorian and others at CIS are conservative, several others are decidedly liberal. The liberal bona fides of our Otis Graham, board members Willard Fair, Frank Morris, and Vernon Briggs are unimpeachable. Research fellow David North ran for Congress as a liberal Democrat, worked at the DNC and in the LBJ administration and has been a passionate lifelong advocate for the American working man and women, whether native born or immigrant.